If you look at my posts this week you will see that they are all breakfast recipes. Breakfast, by far is my favorite meal of the day. 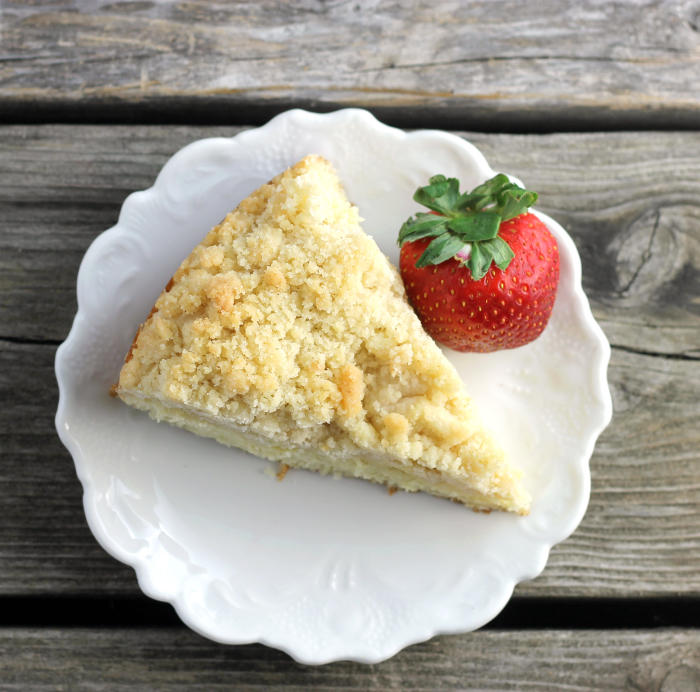 I love coffee cakes and this lemon ginger coffee cake, is perfect for a quick breakfast. I have mentioned that I get stuck on flavors. Right now it’s all about ginger. It is has been my favorite spice for the last couple of weeks; it seems like I can’t get enough of it. I love the combinations of citrus with ginger, I added to my smoothie that I posted last week that had orange, I have made lemon and ginger cookies. I want to mention that this will be a short post today. I did something to my back this week. Sitting here at the computer is a hard thing to do for me. I love this coffee cake so I wanted to make sure that it got posted this week. 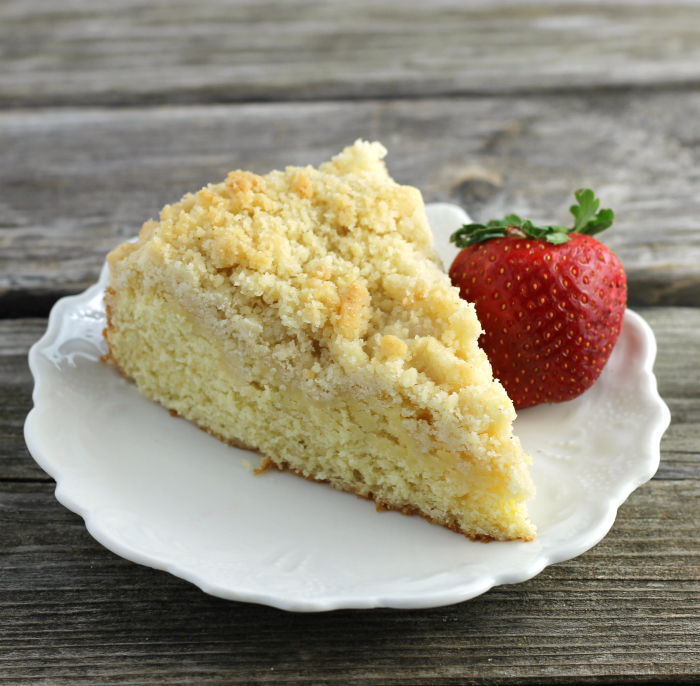 If you like the combination of ginger with citrus you are sure going to love this coffee cake. 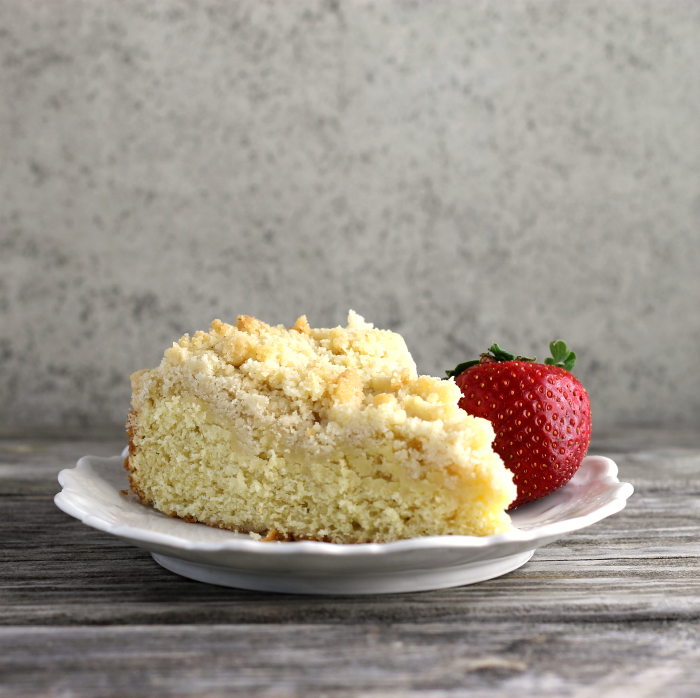 It’s a moist lemony coffee cake with a hint of ginger. Oh, of course, it has a yummy crumble too. Crumble is a must when you are baking a coffee cake, well at least in my book. In a medium bowl combine the flour, baking powder, baking soda, 1 cup sugar, salt, and ginger. In another bowl combine the lemon zest, lemon juice, milk, 1/2 cup melted butter, and eggs. Add the wet mixture to the dry and fold together, just until the ingredients are combined. Spread the mixture in the prepared springform pan. For the crumble combine the 1/2 cup sugar, 1/2 cup flour, 1/2 teaspoon ginger, and the 1/4 cup softened butter, with a fork or by hand mix until the mixture is crumbled. Spread over top of the coffee cake. Remove from oven and cool completely on a cooling rack. My cooking blog is in English with Google translation. I love this cake Dawn ! Two of my favorite flavors so I know I would enjoy your coffee cake. We have friends staying with us this week and this sounds like something I think they might enjoy either for breakfast or as a snack. I’ve pinned this nice sounding coffee cake.